So I’m a Transitioner, am I? Thanks to Mark, who’s allowed me one of his blog spots this week on the Transition Norwich Blog. I realised that since joining the TN bloggers in April, I have only really been posting during theme weeks, and consequently have been limited in what I could write about, so in this post, I hope to convey a bit more of a personal take on what transition means for me – a bit of heart & soul, if you like! I’m 26, and a recent masters graduate. Like many recent graduates, I haven’t got a full-time job, and the prospects of getting one, at least within my field of study (Architectural Engineering) remain dim, as even rapidly expanding companies seem to demand at least five years of relevant work experience. I’d be slightly more bothered about this fact, however, if a 9-5 graduate position in a consultant engineering firm was really going to fulfil my desires and ambitions for life. Whilst it would be great to have a regular income and the opportunity to develop my skills, I can’t bring myself to pine about my lack of formal employment, not whilst the reward for such effort would be the opportunity to join the consumer society, ravishing the Earth with each new gadget, branded item of clothing or trip abroad that I liked the look of. Being underemployed has given me the great opportunity, which I have embraced wholeheartedly, to think about the effect that I have on the environment, on society, and on our economy. When you have to consider what each pound that comes into your care is going to be spent on, lest you fall short at the end of the month, you get to appreciate its effect. From August 2010, when I bought my car, to August 2011, when I sold it, I kept a record of all the journeys I had made, how much it was costing me, and what the journeys were for. This exercise alone taught me a lot, and gave me a new perspective on transportation, and on accommodation. Since I was living 16 miles out of Norwich, in a village with no public transport links whatsoever, the car was a necessity, but after thinking about it, was living 16 miles from Norwich a necessity? The answer – no. So now I live in Norwich, sans car, and paying approximately the same amount each month for the privilege, not to dirty oil companies, but to a dear friend and landlady, whose value, to me, is far greater than any international corporate conglomerate could ever be. This move alone, though, does little to satisfy my thirst for peace of mind in terms of my impact on the world. I don’t just want to have a not-negative effect on the world (and no doubt I’m still nowhere near that, at least ecologically), I want to have a truly positive one! I want to see more than our society just coping with the challenges imposed by the economic system and ecological limits of this world: I want to see a transformation! I want to be part of that transformation, and I want our society to thrive! This cannot be done just by ditching the car and using a bike. It’s a much wider scope – a scope which Transition is the only movement/organisation that has the courage to look at in its entirety, and why I am proud to associate myself with it. It was so inspiring, for me, to attend the discussion meeting after Nicole Foss’s talk on the financial crisis, where the challenges of our modern world were being faced from so many different angles. Our civil liberties being undermined in the name of international security, producerism being the driving force behind consumerism, government cuts skirting round the only sector that made them necessary. And at the core of it all, being our own media with our own vision (rather than that given to us by “The Media”) as the only solution which can carry us through the challenges ahead. 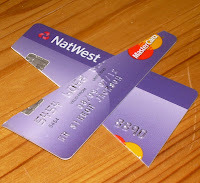 So, when I cut up my Natwest credit card, and transfer any remaining funds which I still hold with them away, I’m not just taking action because it’s what I want to do — in fact, by doing so, I lose out on £1000 worth of interest-free overdraft amongst other graduate “benefits” — I’m also making a statement to anyone who cares to listen – that investment in tar sands, arms trade and other destructive projects is wrong; that massive bailouts should not be coupled with increasing executive pay; that I want any savings I hold to be available as loans to small local businesses, rather than only to national or international chains with no interest beyond this quarter’s profits; that I stand in solidarity with the millions of people who agree that the 99% of the people of this world pay the price for the extravagance of the 1%, and are protesting all over the world (including in Norwich) to bring about the changes required to correct this. But in the end, I’m not the type of person who will just stand here shouting about what I want until someone else comes along and sorts it out for me. I’m a doer, and may every action I take transition to a world that is better – ecologically, socially and economically. Images: my graduation; cycling in Norwich; Natwest credit card – cancelled. Published on 3 November, 2011 at 1:04 am by Simeon Jackson. Post a comment or leave a trackback: Trackback URL.